FPT presents the N67 500hp engine, which will also be available as a package with the ZF 2800 pod drive. 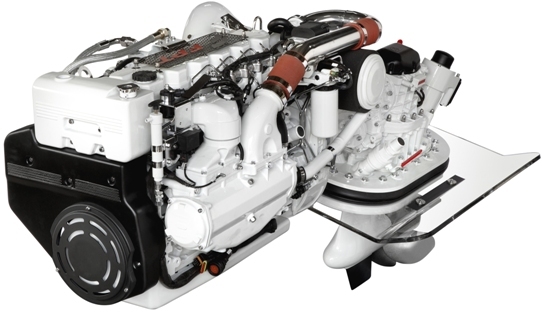 The N67 series of 6.7 liters six cylinders engine is available in other five formats starting from 150, 220, 280, 450, and 560hp engines. In this package the new FPT engine gives impressive results of efficiency and speeds. The new N67 500hp engine with the innovative propulsion system introduced by ZF allows the Nef Series, with six cylinders and electronic Common Rail, to extend its applicative range by entering the established Pod Drive sector. The package, which will be available starting from next January, allows reaching performances at the top of its category; the comparison with the top competitor engines equipped with Pod Drive, in fact shows that the N67 500 PD has: the best power/weight ratio 0.55 hp/kilogram, the highest specific nominal torque 175 Nm/litre, maximum torque 228 Nm/litre, power/volume ratio 0.77 hp/cubic decimetre, and the lowest specific consumption in its category 216 grams/kilowatt hour.